This is one bad rad Cad. It’s the bad boy of all station wagons thanks to a supercharged V-8 making 556hp and 551lb.-ft. of torque. It’s rad because it resembles nothing else on this planet, a black banana that looks wilder than any Kustom Kruiser George Barris ever conceived. But because it’s a Cad, you can pretend that you’re driving the darling car of the senior set. After all, it’s practical, luxurious, ultra comfy, and big enough to carry everyone’s golf bag. Only your right foot and your insurance agent will know better. 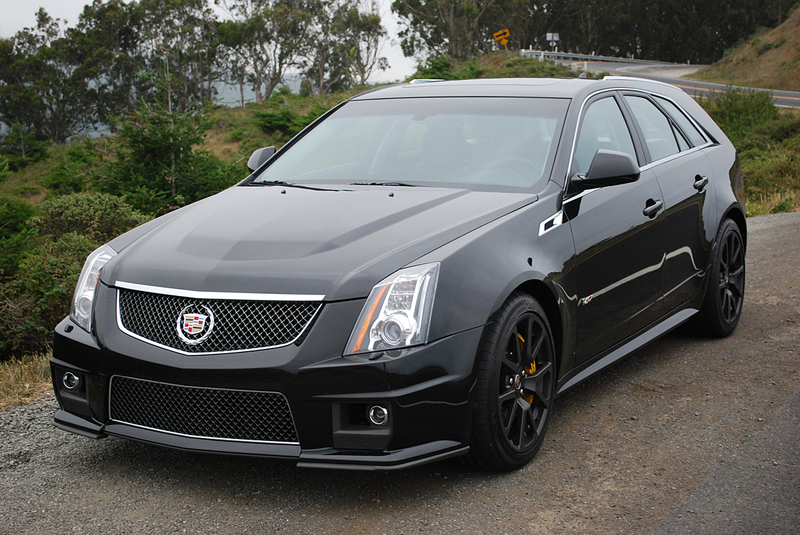 If any car ever made an open and shut case for traction control, it’s this CTS-V. The factory delivers the wagon with a bevy of handling nannies including Stabilitrak Directional Control with Traction Control (TC). In keeping with General Motors’ thoughtful high performance philosophy, you can delete these aids by pressing the steering wheel mounted TC button for about 8 seconds. Do this at your peril. 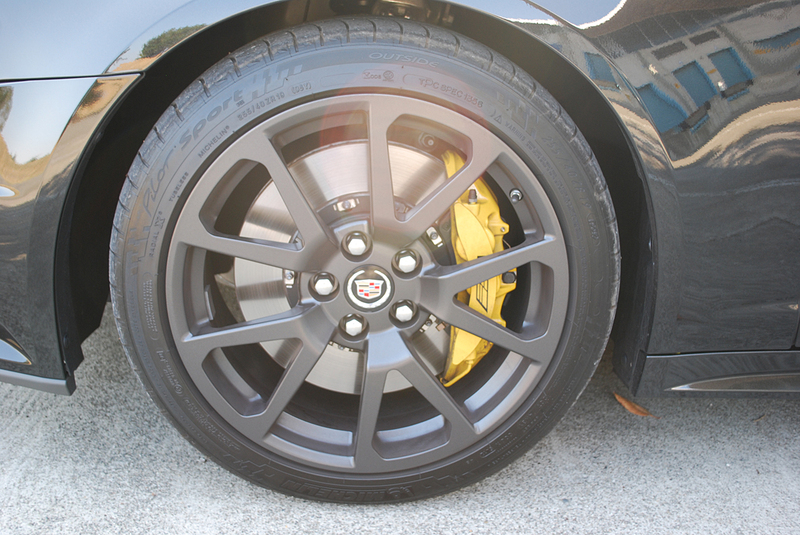 Although the CTS-V is equipped with commendably wide Michelin Pilot Sport tires (255/40ZR-19 f., 285/35ZR-19 r.), they are no match for the awesome torque of this motor when you tromp the throttle with TC disabled. Do so and you can burn rubber from a standstill through an entire quarter mile. If you sensibly leave TC engaged for your acceleration test, the Wagon will bullet through the standing start quarter mile in 12.7 seconds at 111mph without so much as a squeal of protest from the Michelins. 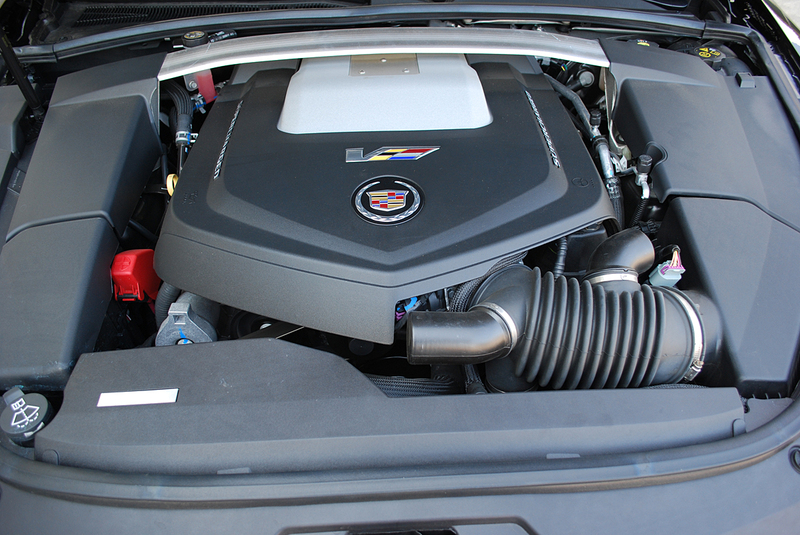 The $63,215 base price of the CTS-V Wagon makes it a sensational bargain. For comparable performance in a rear wheel drive luxury ride, you’d be spending $89,900 for a BMW M5 sedan, $138,650 for a Porsche Panamera Turbo, or $140,000 for a Mercedes-Benz S63 AMG sedan. None of these companies offer wagon versions of their musclecars. A handful of reasonably priced options enhance the V Wagon’s other worldly looks. Black Diamond Tricoat paint is a spectacular addition to the invoice at just $995 extra. Confetti-sized, clear-coated metallic particles juice up the looks of a Caddy that would otherwise look at home leading a funeral procession. Black-out grill trim ($870) and Satin Graphite alloys ($800) augment the V’s Punk Goth visage. Yellow painted Brembo brake calipers ($595) add just the right note of visual relief and levity to the otherwise monochromatic exterior. If you can work past the exorbitant, $2,600 Gas Guzzler Tax appended to the sticker, and cope with the onus of a 14 MPG overall fuel consumption rating, the V Wagon is otherwise a most practical conveyance for large families. The interior space is well arranged to transport 5 adults in comfort, with enough wagon space left in back to store baggage for an overnight trip for the group. The leather-bolstered front seats feature “sueded” inserts on the seating surfaces, and include standard 3-temp level heating. But the seats don’t offer enough lateral support to retain you when the road gets twisty. Another chink in the armor is the lack of true paddleshifts to control the V’s 6-speed automatic gearbox. Cadillac simply provides a pair of small buttons on the backside of the steering wheel spokes to effect upshifts and downshifts. You can circumvent the lack of paddles by using the console-mounted bump stick to effect gear changes. 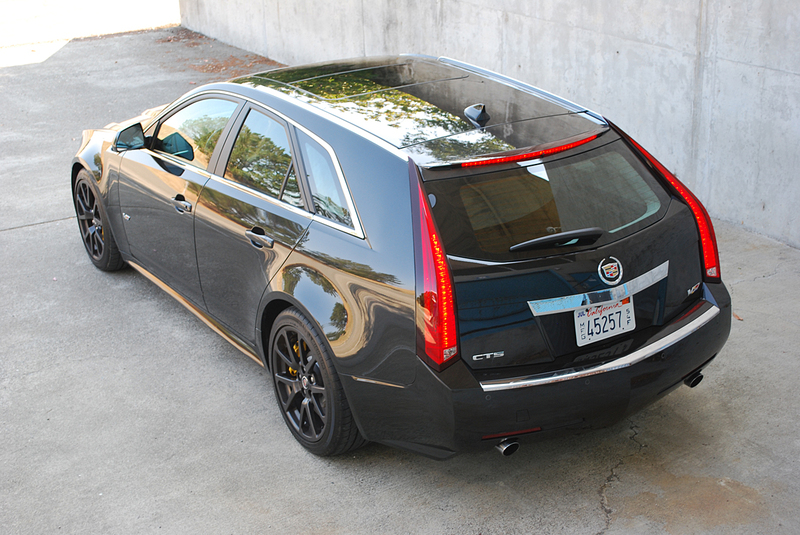 The CTS-V Wagon is unquestionably the most brilliant version of the CTS range Cadillac has yet devised. Capable of functioning as an under-the radar family bus, this sleek stealth missile also stands ready to perform the most heroic musclecar feats without batting a wiper. Since this unique package will never become a mass market commodity, there’s added incentive in buying one now for long term investment potential.